Elpress pre-insulated terminals consist of ring, fork and pin terminals made of copper, and flat or round pin terminals of brass or tinned bronze. All terminals are electrolytically tinned for maximum corrosion protection. Insulating sleeves are usually made of PC, which has excellent deformation characteristics and retains its shape after compression, thus retaining its vibration support. As in difference from example PVC, PC is halogen free. The sleeve colours define the cross-sectional area. It is easy to guide the conductor correctly into the terminal, since the insulation sleeve is of the "easy-entry" type. The Elpress terminals are marked with a logo, the cross-sectional area and where applicable the screw diameter. When crimping is completed with the correct tool, the Elpress dies or tools stamp the insulating sleeve so that all connections can be checked afterwards. Except for the hobby tools, there is a built-in full closure system which ensures that the complete crimping procedure has been performed – a condition for ensuring a professional and high quality job. 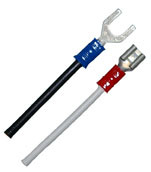 Sample of Elpress crimped pre-insulated terminals. Easy-entry guides the con-ductors strands properly into the terminal. Pages from Elpress head catalogue.